In 2018, the average credit score in America is a FICO score of 704 and a VantageScore of 675. The FICO and the VantageScore are the most popular credit score models used in the industry and both use scores ranging from 300 to 850. The average credit score has been on the rise since the 2008 recession when the average credit score took a sharp drop due to defaulting loans. When looking at how your credit score compares to the average Americans’, there are many factors to consider. Credit reports are updated on a monthly basis causing the averages to constantly fluctuate from month to month. Additionally, lenders do not use national averages to determine what a good score is, but rather use a credit score range. A good credit score is anything above 700 that lands in the prime to super prime category (see chart below for more details). Anyone with a prime credit score should not have difficulty applying for a loan with a competitive interest rate. Although there are slightly different distributions of credit score models, generally you can use the credit score range chart to find out if your credit score is good. Top tier credit scores, categorized as a super prime, range from 781 to 850. Anyone with a super prime score can expect to get the lowest interest rates offered in the industry and can often be pre-approved for most loans. Obtaining a super prime credit score can be difficult and may take years of rigorous lending practices to build towards. Credit scores 660 and under are split into three categories, nonprime (601–660), subprime (501–600) and deep subprime (300–500). Anyone with credit scores under 660 is considered to have a high risk and could have difficulty applying for loans. 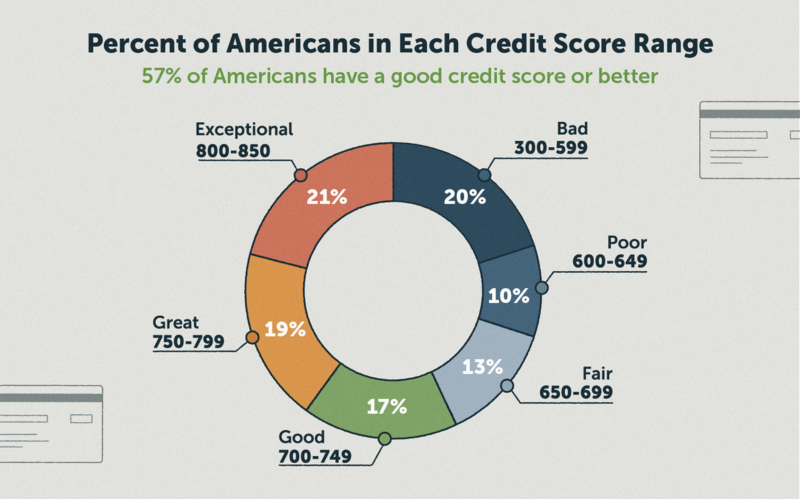 Even if you are on the lower end of the credit score range, you still can change your credit and work towards raising your credit score.Credit score distribution in AmericaThe distribution of Americans’ credit scores shows that over half of Americans (57 percent) have a good credit score over 700 (see green in the chart below). An additional 13 percent have credit scores from 650 to 699. These scores are considered prime and super prime. The 30 percent of Americans with a score under 650 can have difficulty being approved for loans and can expect to pay more with higher interest rates on credit cards and loans. The average credit score varies drastically across the United States from a mid prime credit score to a mid nonprime score. This large variation is due to differences in population and open credit accounts. 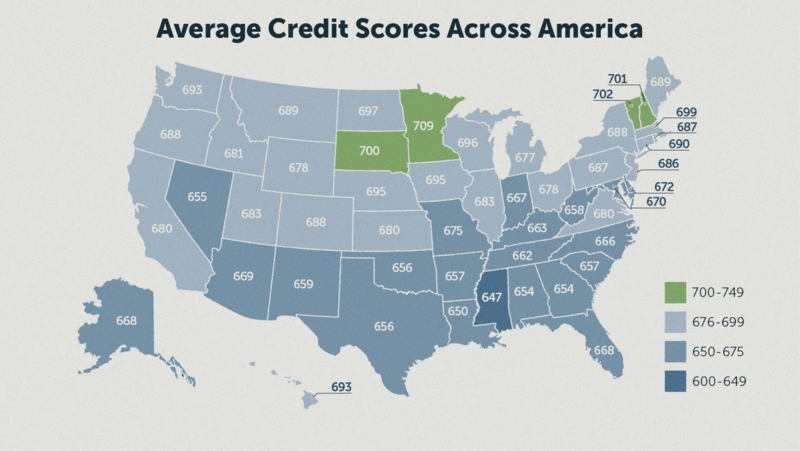 Overall Mississippi has the lowest average credit score of 647 and Minnesota has the highest average credit score of 709. The five states with the highest credit score averages all have an average income above $50,000. These factors can contribute to the higher credit scores by making it easier to make payments on time and borrow less overall. Federal Reserve Bank of New York Data shows also shows the states with the top five highest credit scores have the some of the lowest default rates. The top five states have credit card default rates under 7 percent and auto loan delinquencies under 3 percent. With exception to Georgia and Nevada, the average income for the five states with the lowest credit scores have average incomes under $50,000 a year. With a lower income, some households may be more reliant on loans and using credit to pay bills and make ends meet. The states with the lowest credit scores additionally have some of the highest delinquency rates with auto loan delinquencies over 5 percent and credit card delinquencies over 7 percent. The largest difference in credit score averages is apparent when comparing scores across each generation. With an increase of 95 points from Generation Z to the Silent Generation, it shows how important debt, and length of credit history play into an overall credit score. Younger Americans including millennials and Gen-X carry the most debt in the country. If comparing your credit score to the national averages overwhelmed you, there is still a lot you can do to help. Raising your credit score does not have to be intimidating especially when you have the right tools for the job. Simply reading through your credit history will tell you what you need to work on to raise your score. Whether you need to remove negative items from your report or need to improve your lending practices there is still a lot you can do to improve your score.